With inEntertainment’s Properties module, you’ll be able to log all incoming and outgoing material, cross referenced by creator or who sent it, as well as who you submitted it to. Searchable by any criteria with just a few mouse clicks. Link all incoming submissions to the contact that submitted it. View past submissions with one click. Automatically generate outgoing hard copy or email submissions. Automatically generate a follow-up call. Print sophisticated reports based on criteria such as who submitted the material, who the material went to, date ranges, genre, writer, status, coverage. etc. Assign incoming material to specific employees for read lists. Track multiple versions of coverage, drafts as well as principals already attached. 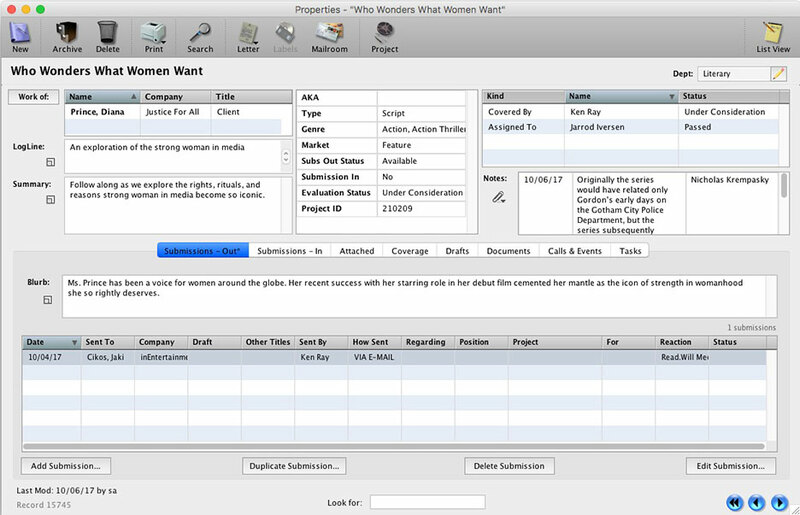 Link documents such as scripts and reels to a record for easy access. inEntertainment’s Properties module is essential for Literary Agents, Managers or Producers.